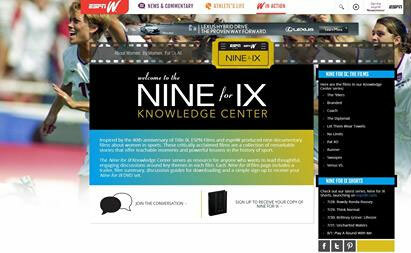 Tucker Center collaboration with the espnW "Nine for IX Knowledge Center"
The Tucker Center has collaborated with espnW's newly launched "Nine for IX Knowledge Center" in producing discussion guides for the Emmy-nominated Nine for IX series of film shorts. The Nine for IX Knowledge Center is a free resource available to institutions, organizations, administrators, professors, coaches, and students who want to lead thoughtful and engaging discussions around key themes in the films. The unique discussion guides for each film were developed by Nicole M. LaVoi, Ph.D., co-director of the Tucker Center and espnW Advisory Panel member. LaVoi says of this exciting collaboration, “The Nine for IX Knowledge Center is a tool that goes beyond the entertainment value of the films and leverages the rich educational content of the embedded lessons and messages within the films,” said LaVoi. “The discussion guides provide educators and students with sound tools to explore and debate the hard-hitting topics that are affecting girls and women in sports,” she concluded. Visit the Nine for IX Knowledge Center to request the Nine for IX DVD box set, view and download the discussion guides, and download other resources, all free of charge.